A tattoo is a glimpse into a person’s soul. It can tell you so much about their world – especially if you know what to look for! But where exactly did this form of body art come from? Tattoos have existed for thousands of years. As far back as the 4th millennium BCE, tattoos were being used for many reasons. Ötzi the Iceman, Europe’s oldest mummy sports a whopping 61 tattoos, but these were not an ancient form of body art. Instead, they are presumed to have been an ancient form of acupuncture used for pain relief. In ancient Greece and Rome as well as East Asia, tattoos were a brand — if you were inked, you were most likely a criminal or an outcast. This use of tattoos continued till as recently as the 1940s; Nazis were still using branding as a prisoner identification system. While this continues to be a painful memory for many, tattooing is now more accepted in modern Europe. Closer to home, the art of tattooing can be traced back to 3000 years ago. Asian mummies with ink indicate that tattoos were a mark of social status, but some were also worn for decorative purposes. Over time, tattoos became a symbol of identity — those that could not afford expensive silk or jewelry found expression in ink. East Asian tattoos were often worn as talismans to ward off evil. They later developed into an art form that used a variety of colours in full body designs telling detailed stories. In places like Japan, these became associated with the Japanese mafia or ‘yakuza’, the most visibly inked members of society. In China, tattooing is still tied to its history of being used as a brand, but this perception has changed over time. Minority groups like the Dai and the Dulong wear facial tattoos that were meant to make women less desirable to attackers in the hopes of preventing abduction and sexual assault. Getting a tattoo with Chinese characters is popular outside of China, but is often discouraged since the characters are complex and you’ll probably get something you didn’t ask for! In South Asia, the Apatani tribe much like their East Asian counterparts have women’s faces tattooed to make them less appealing to rival tribes who might abduct them. In modern times, these tribal markings are seen as a sign of strength and courage, largely due to the painful process that goes along with getting them inked. 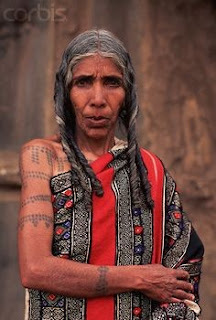 Further south, The Tamilian Toda tribe have tattoos that match the geometric patterns of their clothing. South Asian tribal women continue to wear tattoos for many reasons – to ensure safe passage into the afterlife, to symbolize their faith in magic, and to mark tribal victories and commemorate important events. The art of temporary tattooing using henna is also widely practiced in South Asia and the Middle East and has gained popularity across the world. 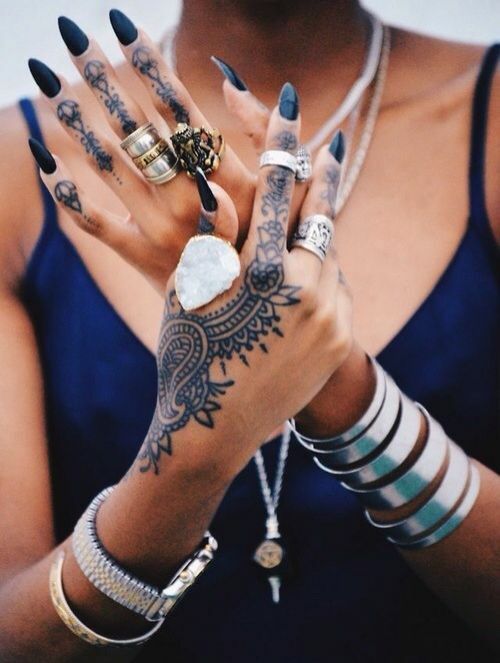 Henna designs are now a trend, even as a permanent tattoo! Western tattoos and methods are extremely popular across the world now. Though different from ancient tattoos, they are definitely inspired by the same practices. British sailors often returned from their voyages sporting new ink, which made the art of tattooing gain popularity in Europe. Nautical tattoos thus evolved into an eclectic mix of tattoo styles from around the world. Sailors often brought back designs and tattooing methods from across the globe, such as East Asian styles of tattooing in the 1800s. Some even brought Polynesian men back with them because of which the sacred ritual of tribal tattooing was introduced into the Western world. This style of tattooing remains popular even today. The expedition of James Cook is credited with coining the term ‘tattoo’ which derives from the Samoan word ‘tatau’, meaning ‘to strike’. Performed by highly skilled masters called ‘tufuga ta tatau’, Tatau is an extremely detailed and painful method of tattooing that can take weeks and sometimes even years to complete. The art of tatau is thought to be at the core of modern styles of tribal tattooing. The history of tattoos owes much to this ancient art form, which continues to inspire tattoo artists and enthusiasts alike. As time went on, getting inked became popular with other sections of society including the rich and elite, changing how tattoos were perceived in Europe. This fascination began as early as the 1800s with the Queen’s grandson getting an East Asian dragon tattoo on his arm. Interestingly, the name ‘Britain’ comes from the Celtic ‘Pretani’ or ‘painted ones’, given to them by the Romans. After the Prince of Wales acquired a cross tattoo in the 1860s, ink was truly embraced in the West. From here, tattooing made its way further West, and tattoo parlours began finding a place in big cities such as New York. 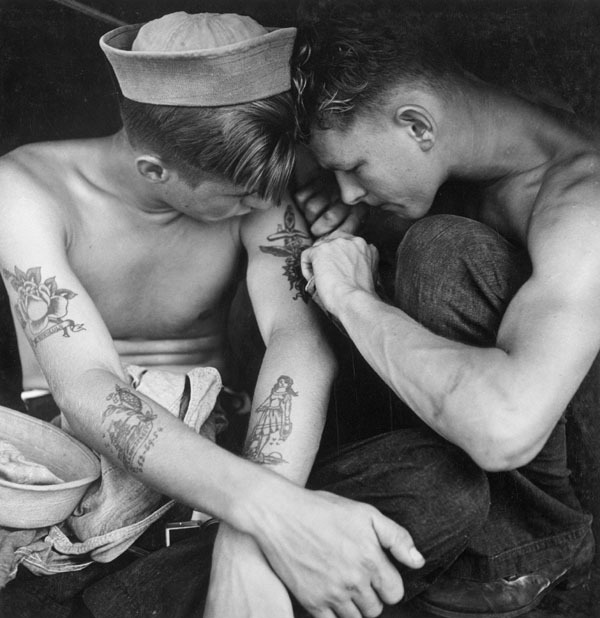 Before its acceptance in mainstream America, tattoos were seen as abnormal. Tattooed individuals were usually part of the circuses as ‘freak show’ acts. The ‘Painted Lady’, an act featuring a woman inked from head to toe was extremely popular, and played a big role in shifting the perception of ink as a high-class fashion accessory to something that belonged to the lower classes. But by the time tattooing took off in America with the opening of new parlours, it had already become quite common; men being sent to war were some of the first to get inked. For some, this was a symbol of good luck, for others a reminder of what they were really fighting for and everything they had left behind. 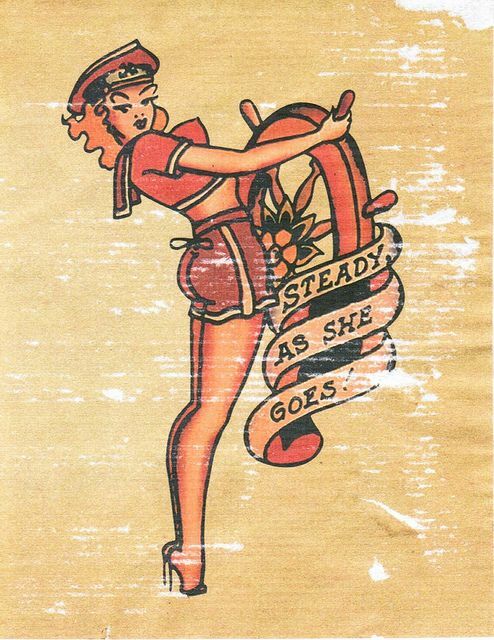 Pinup girls, already a staple of morale building during the war, now found a place in ink. Nautical symbols, such as the anchor or steering wheels, became one of the most popular designs because of sailors and continue to be sought-after even today. Tattooing, however, was not new to the people native to these regions. Even further back in the West, Native Americans were getting inked for pain relief quite like our European mummy from the start of this tale, but they used symbols associated with guardian spirits in their tattoos. Just like their Polynesian counterparts, Native American styles used a detailed and painful poking method to create designs that told a person’s unique story and journey. Later on, tattoos became a symbol of rebellion when the punk scene in Britain began boldly sporting ink, a practice that soon spread to the North American punk subculture. Ink, it would seem, was a great way to tell the world you would no longer be a slave to the establishment. Tattoos became the coat of arms for the marginalized groups, who proudly displayed their identities on their skin. Punk style clothes, tattoos, piercings, and attitude. A growing art form, getting inked is at the forefront of modern self-expression with a history and legacy that lives on in the very skin of the inked. A revolution, a symbol of hope, a call to action, a message to yourself — a tattoo can be anything you want it to be. 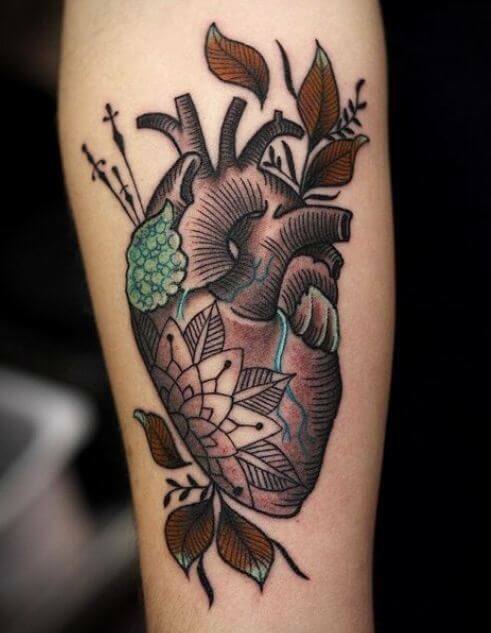 To get inked is to wear your heart on your sleeve — sometimes quite literally! Jhaiho is a platform that connects you to tattoo artists in Bangalore. Did you find some inspiration in our post? Or perhaps you already have your design? Head over to m.jhaiho.com to find your tattoo artist today! Join our growing community of inksters! Follow us on Facebook, Instagram, Twitter, and LinkedIn to stay up-to-date on the latest in the tattoo industry, get inkspired, and share your own ink stories! Thanks for stopping by! Happy inking! Thankyou! We hope to continue bringing you content you enjoy! Our pleasure! Be sure to subscribe to our newsletter for more! Thanks! We hope you continue to enjoy our content! Hey, thanks for stopping by and sharing our blog! Glad you enjoyed it!